iBasso D2 Boa review | What Hi-Fi? 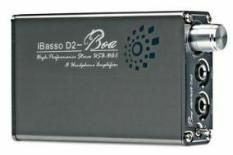 If portability is a virtue you admire in an external DAC, the 108g iBasso D2 Boa is well worth investigating. Scarcely bigger than a box of Swan Vesta matches, the D2 has a mini-USB digital input for use with a computer and 3.5mm output. Its Li-polymer rechargeable battery is good for 38 hours continuous use, and charging takes place on-board. You can use the iBasso with your iPod, but it's your laptop that will benefit most. Compared to the sound from one of our many laptops when linked directly from its headphone socket to an amp, the iBasso is a burlier and more direct listen. Though it's not the last word in organisation, and the soundstage can be a little vague, the D2 adds greater weight to low frequencies while bringing more detail and verve to the midrange. This rather pleasant effect is the same when using the D2 as a headphone amp, making for an articulate, forthright little device.